Shoot for the moon and land among the stars! 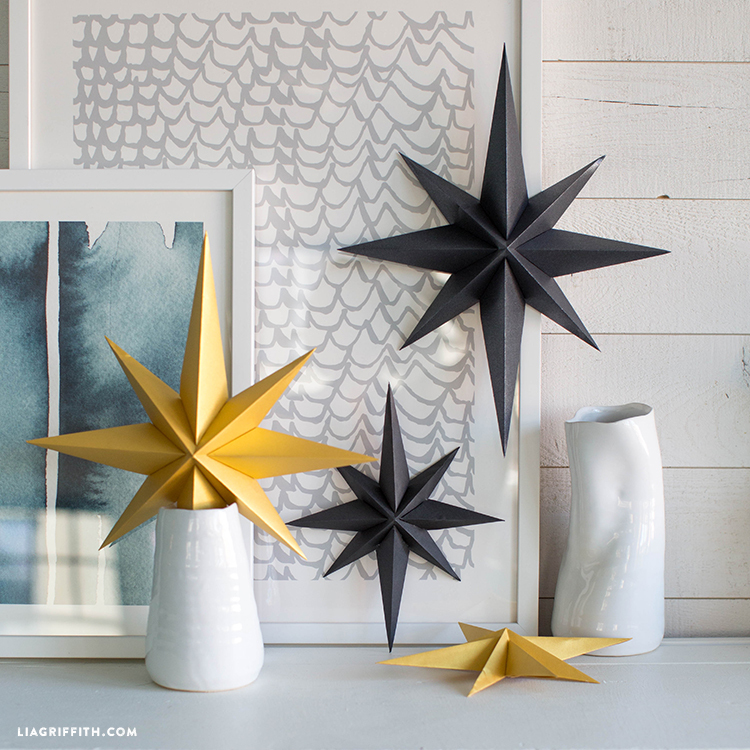 These mod-inspired paper stars are a New Year’s Eve necessity. 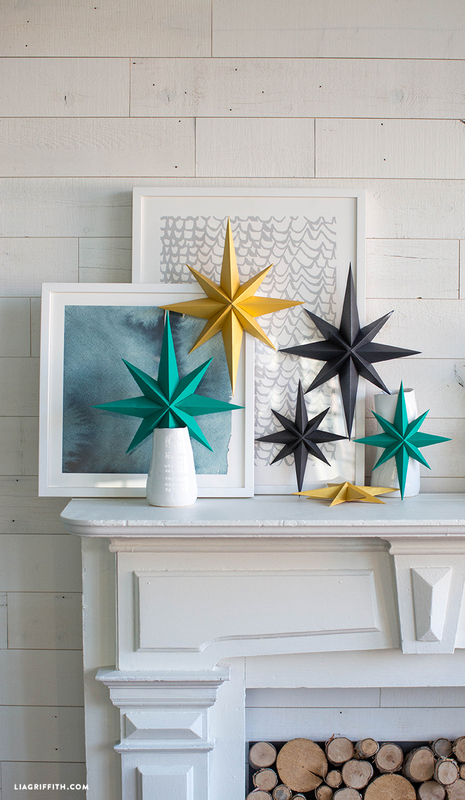 A perfect party decoration for every glamorous holiday soiree. 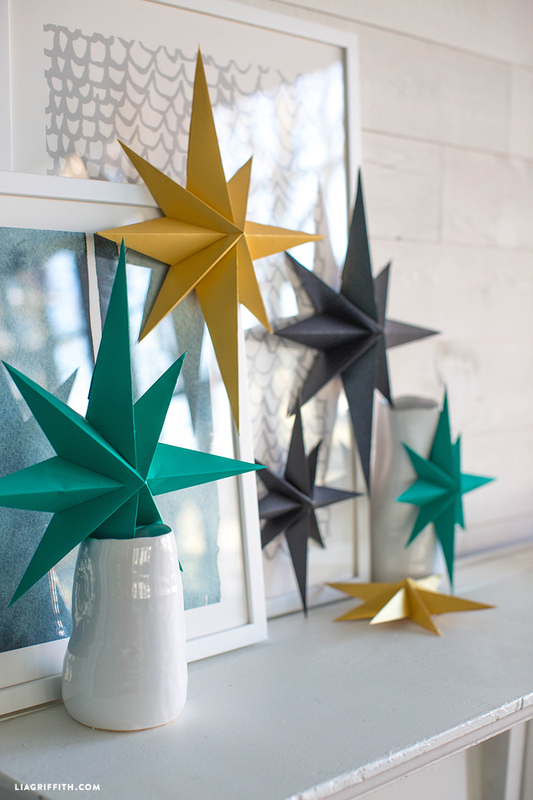 Made with a selection from our friends over at Paper Papers, these stars are both simple to assemble and gorgeous as can be! 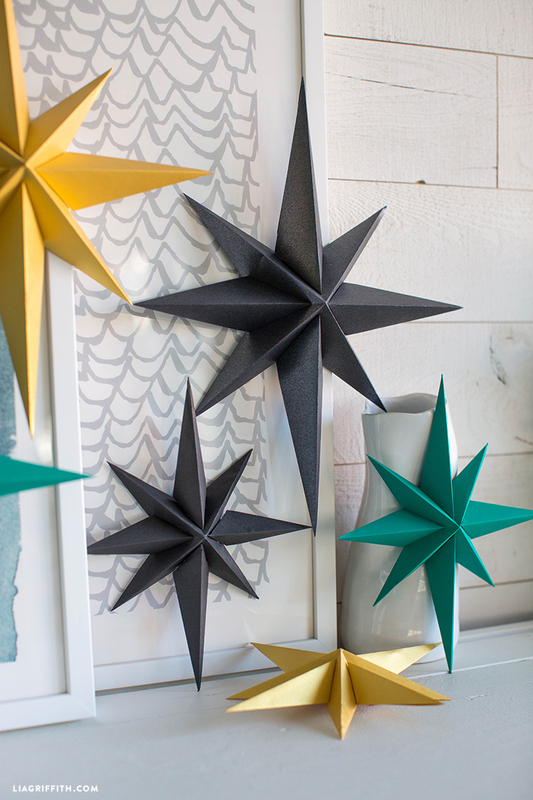 To make some stars of your own, download our templates below and then pop on over to PaperPapers.com to craft along with our step-by-step photo tutorial. If you plan on using a cutting machine, download our SVG files. If you will be cutting with scissors, use the PDF version. Find all of the papers we used for this project here. Happy crafting! Cut the paper according to the template notes using scissors or a cutting machine. Take the four arrow shaped cuts of paper and fold along the score marks. Take the square cut of paper and fold along the score marks. Overlap two of the triangle shaped folds to form one point of the star, then use the dot roller to glue it together. Repeat with the three remaining points. 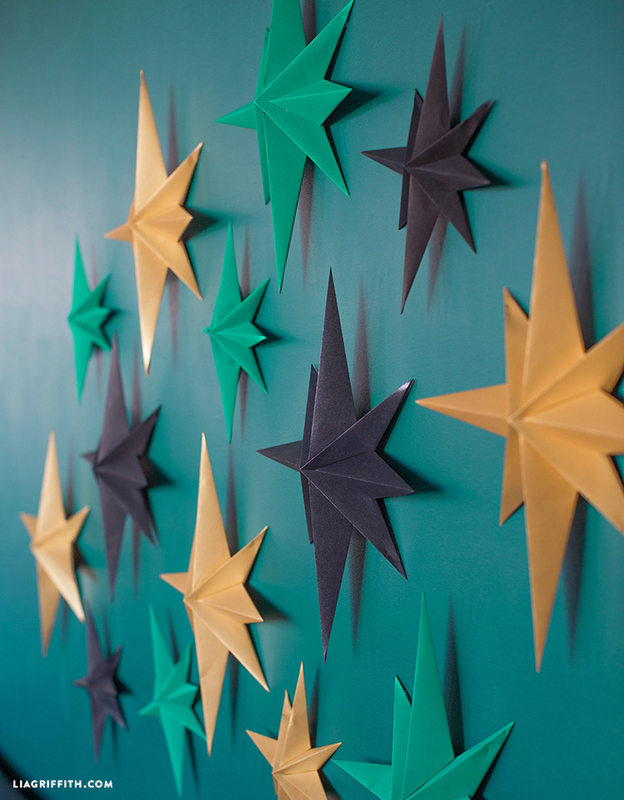 Take the arrow shaped papers, overlap the two larger triangle shaped folds to form one point of the star, then use the dot roller to glue it together. Repeat with the smaller triangle shaped fold. Pinch the smaller triangle shape together to form a fold line down the middle, then repeat with the remaining three star points. Apply glue dots to the base of each of the four points. 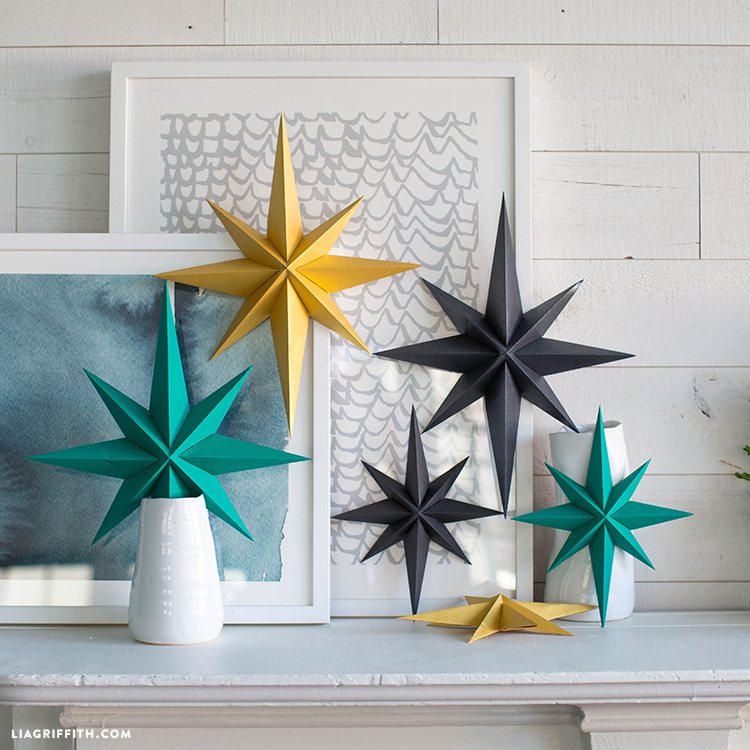 Attach the longer points across from each other on the four pointed star you made earlier. Then attach the two shorter points across from each other in the remaining spaces. What a cute project! Love the colors that you chose.